HomeHeadphone ComparisonsShure Beta 87A vs. 87C | A LOT TO SPEAK OF! 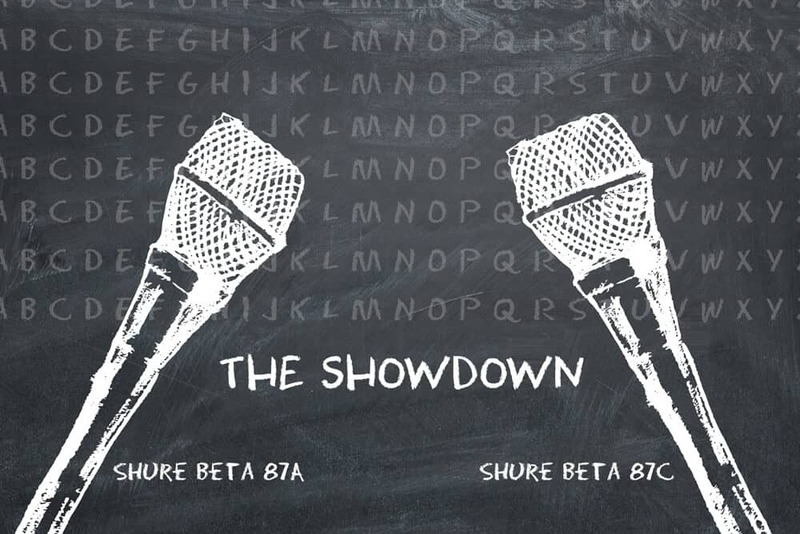 Before we get into the Shure Beta 87A vs. 87C comparison, grab a snack, sit back and relax because.. Type. Both are condenser microphones that require 48v phantom power to operate. Condenser mic vs. Dynamic mic. This phantom power can come from stuff like combo amps, audio interfaces, mixers, etc. What does an audio interface do? Both have a very crisp and articulate sound, with some nice added warmth, timbre, and smoothness. What is Timbre? Both are around the same price. Both are versatile, and can handle more than just on stage vocals. Because they’re both condensers, recording stuff in studio, voice-over, female vocals, softer type vocals, as well as various types of instruments becomes a very realistic proposition. Just be aware that the 87C is more flexible. More on that in the differences. Both require very minimal EQ, if any at all. Both of these have very good gain before feedback, and thus can be pushed pretty hard to very high Sound pressure levels. What is SPL? Accuracy and confidence. Another thing to keep in mind is how accurate these are. They will make a good singer sound a lot better, but will not make a poor singer sound good. So I would say if you’re confident in your performance, these two are phenomenal. If you’re not as comfortable with your own abilities, perhaps these aren’t for you. Both have a frequency response of 50Hz – 20kHz. Both have in internal low frequency roll off to reduce boom sounds. Both have an advanced shock-mount system to reduce handling noise. Both have a built in pop-filter for sibilant sounds. What does Sibilant mean? Both have a dynamic range of 117 dB. Placement. The Beta 87A works well if your monitor is off to the side, while the 87C works better if your monitor is directly behind you. For the 87A, you will want to have your monitors facing slightly in towards you at an angle for best results. *Polar Pattern. The Beta 87A has a supercardioid pattern, while the 87C has a unidirectional (or simply a cardioid) one. This means that the 87C picks up sound from one specific area of the mic, generally right in front. That said, the 87C’s pattern isn’t quite as tight as the supercardioid pattern of the 87A. The supercardioid pattern has an even tighter area of pickup than the cardioid, but has the added benefit of rejecting sound from the sides, as well as ambient sound better. The downside is that it’s a little bit more sensitive to sound coming from behind, and sometimes causing feedback. Application. Because the 87C doesn’t have as tight an area like the 87A, it can pick up stuff like instruments and guitars better. Also, because the 87A’s area is so tight, when a singer moves their head a lot there may be a drop off in sound. The 87C handles that “swing” much better. This is probably the main difference between these two mics. Another thing to keep in mind is how you’re monitoring. If you’re primarily going to be using IEM’s (In-ear monitors), the 87C is the go to. If you are going to be using wedges, the 87A is the better option. This is simply due to the fact that the 87C sounds more natural with IEM’s, while the 87A is better with floor monitors because it will provide more gain before feedback. Brightness. The 87A may be a bit brighter in the treble region than the 87C, and will do better with female lead vocalists. Signal to noise ratio. 70.5 dB for the 87A vs. 72 dB for the 87C. I found a cool vocal sample here! I would say that if you need a microphone that’s a bit more flexible in application, the 87C fits the bill quite nicely. It has a bit more “wiggle room” so to speak, in that it’s not as strict about placement. If you know you’re going to be primarily on stage or in live situations, and you know you get a bit wild with the mic and like to move around a lot, the 87C is your boy. On the flip side, the 87A is very specific in where you can be in relation to it, but has the benefit of rejecting sound from the sides, as well as ambient noise. This means that it will cut through a mix with a lot going on quite easily. If you have a large band with a lot of loud instruments, or you’re a podcaster/voice-over artist who needs an extremely articulate mic with hardly any EQ required, the 87A is what you’re after. Just be sure that you’re primarily going to be singing from a relatively fixed position, as it won’t handle the “sway” quite as well. Well that’s about it for today my friend! I hope you’ve enjoyed this Shure SM87A vs. 87C comparison. AKG Q701 vs K701 | CLEAR WINNER!